What if the world cup was determined by the amount of social media generated? Football’s biggest event has began, with almost 3.4 billion eyeballs expected to tune in to Russia’s 2018 FIFA World Cup. According to bookies, the top five countries to watch are Brazil, Germany, Spain, France, and Argentina. But we asked another question…. What if the result was determined by the amount of social media your team could generate? We decided to look at the social chatter and see if the World Cup was decided on this alone, what would the result be, and what else we could learn. Method: We used Salesforce Social Studio. There’s a lot of data. Literally billions of mentions of #worldcup, #wc, #cupdumonde, #fifa etc across the social web. So much data in fact, we decided to focus just on the countries that were participating in the World Cup, as well as anglicised names and hashtags of their playing squad. Timing: These insights are all prior to the World Cup starting. We will do the same at the end of the World Cup but this is what we have discovered so far. No surprise here….Messi, Messi and then Messi. Lionel Messi is the most talked about player with 785 000 mentions. Mohamed Salah of Egypt takes second place with 461 000 and Cristiano Ronaldo takes third place with 308 000 mentions. Only the countries Argentina, England and Colombia were mentioned more than these players. With big international events come big international sponsors, keen to tap into celebrity footballers and national passions. 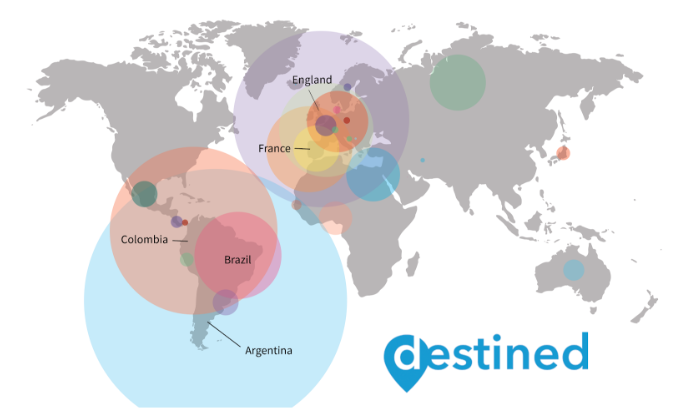 This year’s World Cup is no exception, with over 500 000 mentions. Coca-cola takes the lion’s share, with almost 248 000 mentions, followed by Hisense (almost 120 000 mentions) and Adidas (with just over 60 000 mentions). Coca-cola saw a large spread of topics across the World Cup, with no one player dominating mentions. It’s no surprise that Jason Derulo is mentioned in over 10% of posts – Colors (sung by Jason Derulo) is the Coca-Cola Anthem for the 2018 FIFA World Cup. 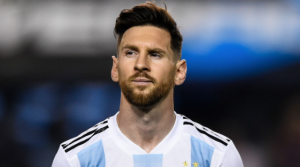 Hisense was popular with the Japanese audience, contributing to 98% of content, while Adidas saw only 4 400 mentions of Messi in conversations. 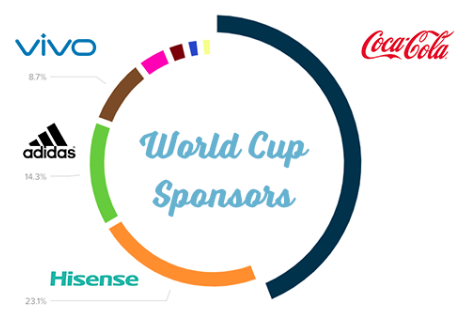 Following the world cup we will provide a deeper insight into the sponsors and the value generated (request copy). This is despite both Japan and South Korea qualifying as participants. The reasons behind the low numbers of mentions may be because our analysis has focused on the Anglicised versions of player names and the Korean peace process has been the primary topic of conversation. The Middle East and Africa see significantly lower numbers than other countries, highlighting the digital divide that exists between developing and first world countries. Restricted access to social networks also sees lower participation on Iran and Saudi Arabia. 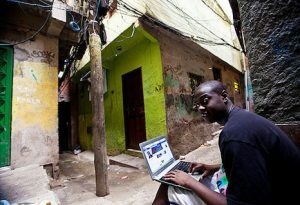 The digital divide can also been seen when comparing Argentina, 786 000 mentions, population 44m and 70% with internet access to Brazil 262 000 mentions with a much larger population of 190m, but with only 49% with internet access, along with high levels of poverty and lack of access to education. Who is getting the love? The players were the most talked about topics, with Lionel Messi coming out on top. Interestingly though, former greats were also discussed, such as Zidane and Beckham. Fans also wanted to know where they could watch games and when they were broadcast on TV. Overall, there is a 56% positive sentiment towards the World Cup. All teams captured the passions of their countries – with the exception of the Swiss team, where mentions of them online was 66% negative, with fans lamenting the need to play both Brazil and Germany to be a chance of making the finals. A quick look at the negative sentiment generated online shows that words like “exploit”, “clash” and “fight”, are used to describe games. We can also see the prevalence of digital activism online. Although FIFA is no stranger to controversies, conversations focused on Russia’s recent geopolitical crises and reports of North Korean slave labourers building the stadium. So what did we conclude? If you ran purely off the amount of traffic generated by a country, then Argentina was a clear winner. A large part of this was due to Messi and the traffic he generated. England second, Columbia third, France fourth and Brazil fifth. But we decided that this was not fair. Based purely on population you could have guessed these outcomes. So we have added in two additional factors into our analysis – a country’s population and their smartphone penetration. As the Cup goes on we are going to publish more social insights as we discover them.